I was introduced to American musicals through German television. Although I saw much music theater on stage growing up in Germany, it was all opera productions my mother (the coloratura soprano Catherine Gayer) was performing in. 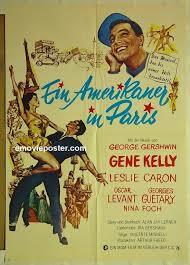 I performed musicals at the German-American John F. Kennedy School in Berlin. It developed a thriving drama department that staged many classic musicals. But when that began in 1980 I was already 13 years old. Until then my main source of exposure to musicals was whatever was shown on German television. When I think about my childhood and musicals I think of “Des Broadways liebstes Kind” (roughly translated as “Broadway’s Dearest Child”). That was the anthology television series, begun in 1969 and discontinued sometime in the 1980’s, that every so often would air classic Hollywood musicals on the ZDF, the Zweites Deutsches Fernsehen (Second German Television – back in those simpler times, there were only two main German TV stations, a third regional TV station, for example SFB – Sender Freies Berlin or Station of Free Berlin – for us in West-Berlin, and the two East German TV stations, which most of us in the West avoided watching). 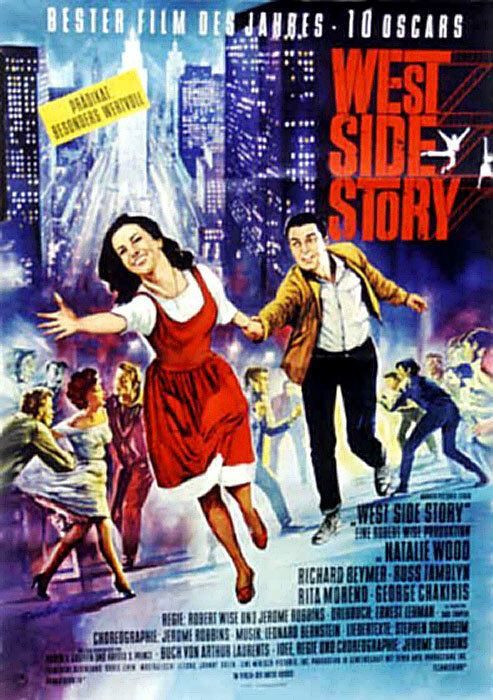 “Des Broadways Liebstes Kind” would be the umbrella name for all the musicals shown on ZDF, whether they were movie musicals of actual Broadway classics like “West Side Story” or “Camelot” or whether they were of movie musicals that originated in the Hollywood studios, like “Wizard of Oz” (renamed “Das Zauberland” – “The Magic Land” – for German audiences) or “Singin’ in the Rain” (renamed “Du sollst mein Glueckstern sein” – as in the song title “You are My Lucky Star”). That distinction didn’t really matter to the TV programmers. I loved watching movies in general and movie musicals in particular. The songs, the dancing, the spectacle, everything about movie musicals enthralled me as much as I was enthralled by the inventive suspense of Hitchcock or the thrills of science fiction and horror or the joys of animation. But there was one particular treat the Broadways liebstes Kind musicals offered that I could get no where else growing up in Berlin in the 1970’s: I could hear English performed on screen. German Television showed many American movies and TV programs, there was no shortage of culture from the Motherland, so to speak, but it was all dubbed into German. Except for most of the musicals. The dialog would be dubbed, but the songs would be in English with subtitles. Later German TV and movie theaters would offer more opportunities to enjoy films O.m.U. (Original mit Untertitlen – Original (sound) with subtitles), but when I was a child musicals on TV were for the most part the only way to hear English on screen or stage. There were exceptions. Popular German translations of some classic musicals had been performed on stage, so when the movie versions of, for example, “My Fair Lady” and “Kiss Me Kate” came out even the songs were (unfortunately) dubbed into German. But most of the time, when I was first introduced to classic movie musicals like “The Music Man” or “An American in Paris”, I was able to hear the songs in the original English. Eventually, when German TV got a little more generous about broadcasting without dubbing, the SFB aired some classic Hollywood musicals like “Stormy Weather” and many black and white Fred Astaire musicals (with Ginger Rogers or Rita Hayworth) with no dubbing at all, all dialog and singing in glorious English, for us Americans in Berlin pure heaven! Or I should clarify, for us Americans in Berlin who did not have American military privileges. In those Cold War times, American forces were stationed in West Germany and West Berlin (while Soviet forces sat in East Germany and East Berlin). 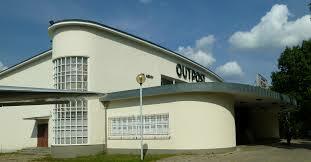 There was a special movie theater, the Outpost, that showed US movies to the military families. Every now and then I would be invited by one of my friends with military privileges to see a movie in English at the Outpost (rather than dubbed into German at the Marmorhaus or the Zoo Palast). There was also AFN, American Forces Network, the TV station serving the American forces. Unfortunately, only if you were part of the military could you acquire a television set that was able to receive AFN’s signal properly. My parents worked for the Freie Universitaet Berlin and the Deutsche Oper, we were American civilians living in Berlin, not American military personnel stationed in Berlin. Before the late 70’s, when some change in regulation and/or technology made it possible for “regular” Berliners to access AFN, it wasn’t possible to watch all that exotic current US television programming in the original American. But once it was possible, I too was able to laugh my 12 year old head off watching “Three’s Company” or “Laverne and Shirley” like any other contemporary American kid. Before then, and before I started performing musicals like “Bye Bye Birdie” and “Guys and Dolls” on stage in school, “Des Broadway’s liebstes Kind” was my sole introduction and supplier of American musicals. I didn’t realize it at the time, but I would learn a lot from watching those musicals on TV. They would leave a deep impression on me, providing the formative foundation for the artist I would become. This entry was posted in Beginnings, Cinema Scope and tagged 1970's, AFN, American Military, An American in Paris, Berlin, Broadway, Cold War, Des Broadways liebstes Kind, Germany, John F. Kennedy School, musicals, Outpost, Singin in the Rain, West Side Story, ZDF. Bookmark the permalink.